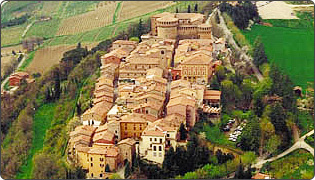 The historic center of Dozza, with the characteristic spindle shape, is situated on the crest of a hill overlooking the Sellustra valley and it gently slopes towards the Via Emilia. The original medieval buildings have been preserved to maintain the harmony between the imposing fortress, at the apex of the country, the underlying residential area developped along the ancient walls, and the surrounding nature. Even today the village is crossed by two parallel streets that end at the front door of the castle's square. The village is accessible from the arched gate built in 1614, opened in Rivellino, 14th-16th century defense work and drawbridge, now partially buried. The art becomes the urban landscape and decorates the walls of houses, streets and squares, giving light to all corners and sudden opening suggestions. Dozza is this, too. To be precise, we're talking about the Biennal of "Painted Wall", a unique event of painting on the walls of the houses, held in septembrer, where artists paint "live" before the public. The first edition was organized by the Pro Loco in 1960, from a brainchild of Thomas Seragnoli and thanks to the cooperation of other people like Fernando Baroncini, Ennio Sangiorgi, Gardi Gino, Gino and Mario Guermandi Nereidi. Since then the event has become increasingly qualified biennial of modern art, ennobled by the participation of important masters of painting, including Matta, Saetti, Sassu, Licata, Purificato, Brindisi, Sughi, Schweizer, Zancanaro, Frasnedi, Gagliardi, Mascellani e Zigaine. The "Painted Wall" soon left the formula for the extemporary show and was one of the first Italian festivals to abolish awards and rankings pointing to the primacy of the artist instead of the hegemonic temptations of criticism. Over than 200 artists have taken part to the 18 editions of the show, transforming the medieval town into a veritable outdoor museum, with over 90 paintings to adorn the façades of houses. From several years there are also sessions of restoration works to ensure the best preservation. A special edition of "Painted Wall" was held in 2000 as part of "Bologna, European Capital of Culture". Some "tears" of the frescoes are preserved in the Pinacoteca, set up inside the fortress. Linea Bologna-Ancona-Rimini: Castel San Pietro Terme stop.